« Day 218 – Keely S. and Deborah P.
Day 219 – Tara H.
Day 219 was an interesting experience. It ended up being about 10:00pm and I hadn’t given away my $10 yet. On my way home from an event I attended I decided to see who I could find at Dupont Circle. I saw a group of people sitting on the edge of the fountain. A young lady in their group was actually standing in the fountain and two others dangled their feet in the cool water in search of some respite from the smothering heat. Just as I got close to them they spotted a friend passing by and started chatting with him. I kept walking to the south side of the fountain and sat down on a bench and just watched the scene for a little bit. It wasn’t long before I spotted Tara and Sean. I saw a couple who were standing in the fountain getting their picture taken by a random person. They were using their phone to take the picture and I overheard someone saying that the picture didn’t come out very well. Although I didn’t have my SLR camera with me I did have my small canon digital camera that my friend Patricia lent me when my canon digital camera died. I figured I might be able to get a better picture for them. While offering to take their photo I took advantage of the opportunity to ask them to be my 219th recipient. This launched us into a thirty minute roller coaster discussion about my motives and reasoning behind my project and giving in general. While Tara seemed more open to accepting the $10, Sean was quite clear that he didn’t want the money. A few times he actually said that he would accept it but wanted me then to go and find someone more “deserving” to give it to. I explained that he could do that but he wasn’t interested in that option. At a certain point I wrote the encounter off as a refusal and decided to take the photo of the two twenty-somethings anyway and send it to them. About that time Tara made me an offer. “If you get in the fountain with me I will accept your $10” I was dressed in a suit and can assure you that if you had asked me earlier that day to name 100 potential things I would be doing later that evening, jumping in the fountain at Dupont Circle would not have made the list. With a little encouragement from Tara I decided to take her up on the offer. I think this marks the first time that I have had to do something for someone else in order for them to accept my $10. swung my leg over the edge of the fountain. Before I knew it the two of us were standing in the middle of the fountain laughing as Sean took a photo of us. It was fun and felt really good. We got out of the fountain and I let my feet dry off a little. I found out that Tara works for a property management firm in Annapolis, MD where she has lived her entire life with the exception of attending East Carolina University. Sean and her have been friends since their freshman year of high school. On this night they were just hanging out, catching up with one another and having a few drinks. I put my socks and shoes back on and said goodbye to them both. They headed toward the Dupont Hotel and I headed back toward my place. 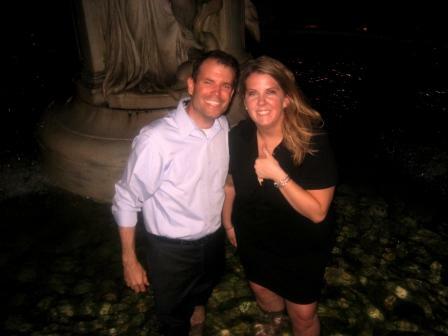 I met you last night in the Dupont Circle fountain and you chose my friend Sean and I to be your Pay it Forward. I wanted to let you know after a deliciously over priced martini at Cafe Dupont, before retrieving a cab, I walked back over to the circle and woke up a homeless man. I asked him if he was hungry, he said “of course” and then I handed him the $10. The first words out of his mouth were “God bless you, your an angel” and I just walked away. I’ve read many of the responses on your blog about peoples’ judgement on why we (being the participants that give away the money to someone that “deserves” it) would do such a thing. It isn’t even because it made me feel good, because it didn’t, I was thinking about the much larger picture and impact that you are having on so many people. After grabbing the cab and passing off the $10, we went back to my friends house and were sitting there telling his roommates about how we met this crazy guy named “Reed” and everything about the Year of Giving and his one roommate was like “Yea, yea, yea… OH MY GOD, I’ve heard about this guy! He’s like famous.” And of course I start laughing immediately at Sean from his skepticism but we were so enlightened by the whole experience. b) We could have easily spent the $10 at the bar but instead that $10 fed a homeless man for the next 2 days. c) Making you get into the fountain with me just so you could give me $10 was RIDICULOUS! d) What you are doing is special, kind and humbling. God bless you and your ventures!!! I’m excited to follow you up until your Christmas Party! I love this one! I always enjoy reading your perspective on giving, but it’s especially fun to hear from Tara on how the experience effected her. I love Tara’s response [via email] very nice. I am happy that she gave the money to a homeless person and that you took the time to get into the fountain. Why not?